Pilot Medical Solutions provides this eye chart as an educational tool for pilots. 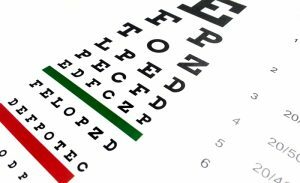 Waivers are available for visual acuity not meeting FAA standards. This test should be used for screening purposes only. Only a qualified medical practitioner can provide an accurate assessment of your vision. For best results, use a laser printer. Printer should be formatted to print page “as an image” and not configured to fit on page.